NYC Health Commissioner Dr. Oxiris Barbot stated that she would continue to allow a mass animal sacrifice that takes place in Hasidic Jewish communities before Yom Kippur. During Kaporos, the blood, feces and body parts of thousands of chickens contaminate the streets of the same Hasidic Jewish neighborhoods that are now experiencing a measles outbreak. The Kaporos ritual violates 7 city health codes. During a public health forum held at the City University of New York on April 1st, 2019, NYC Health Commissioner Dr. Oxiris Barbot stated that she would continue to allow a mass animal sacrifice that takes place in Hasidic Jewish communities before Yom Kippur. Dr. Barbot delivered the remarks in response to an audience member who asked if the Department of Health would begin to enforce the health codes violated during the sacrifice, called Kaporos, in light of the reports of E. coli infection and a measles outbreak in the same community. Advocates say that Dr. Barbot’s response, which did not acknowledge the health code violations or the reports of E. coli, affirmed their fears that the Health Department will continue to wait for a disease outbreak to occur before enforcing the seven health codes that are violated. In response to Dr. Barbot’s remarks and her announcement that the City was declaring a public health emergency due to the measles outbreak, numerous public health and animal welfare advocates staged an impromptu rally at City Hall to draw attention to the City’s ongoing refusal to take measures to prevent the outbreak of another potentially lethal disease in the same community – an outbreak that would likely spread outside of the Hasidic communities where the public slaughter takes place. ABC News reported on the advocates’ rally as part of its coverage of the measles outbreak. For the past 1.5 years, public health and animal welfare advocates have protested Dr. Barbot and other city health officials over their refusal to enforce the multiple health codes violated during Kaporos. During the ritual, an estimated 60,000 chickens are trucked into Brooklyn, held outdoors in crates for up to a week and killed in approximately 30 open air slaughterhouses erected without permits on residential streets. 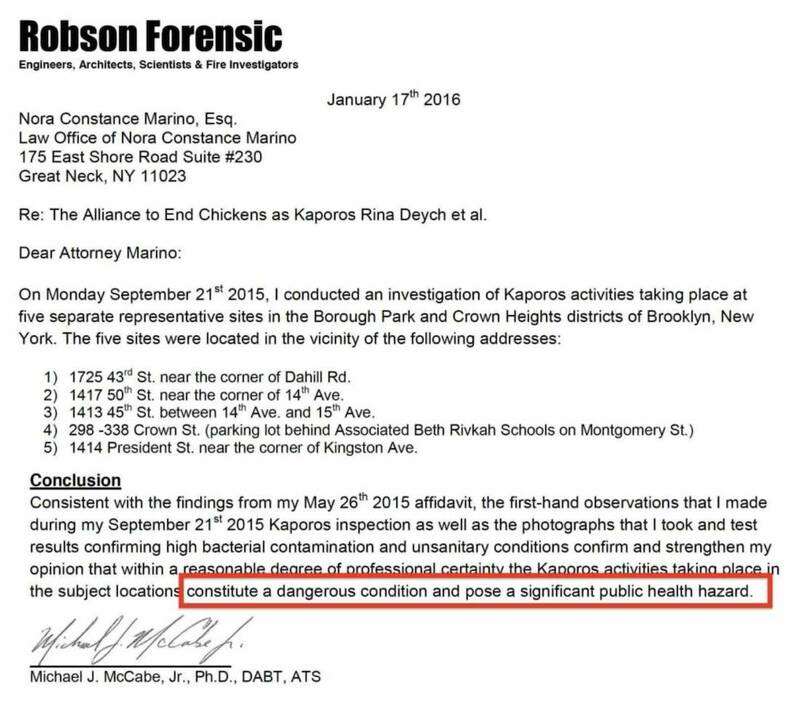 The blood, feces and body parts of the chickens contaminate the sidewalks and streets during the ritual and in the days that follow, exposing New Yorkers to E. coli, coliform and other pathogens and toxins, according to a renowned toxicologist who collected samples on behalf of area residents suing the DOH and NYPD over their failure to enforce the health codes. In spite of the toxicology report outlining the public health risks associated with Kaporos, ultra-Orthodox Jewish children work in makeshift slaughterhouses erected for the annual ritual sacrifice without any protection against disease. Mayor de Blasio’s Health Commissioner, Dr. Oxiris Barbot, and the Deputy Commissioner of Disease Control, Dr. Demetre Daskalakis, have refused to address or acknowledge the toxicology report that outlines the public health risks posed by the mass slaughter of 60,000 animals on residential streets during Kaporos. During the past two years, several non-Orthodox people who were exposed to the chickens contracted E. coli. Two of them spoke out during a press conference at City Hall. Advocates speculate that many Kaporos practitioners also become sick each year due to their exposure to sick and dying chickens, but do not report it. For more information, visit ALLIANCE TO END CHICKENS AS KAPOROS.